Guo Pei took to the temple, allowing her imagination to roam a spiritual safe haven of palatial proportions. With elaborate craftsmanship as the driving force, the designer offered a wide-ranging futuristic and Gothic-infused lineup, part warrior princess, part illustrious queen. An unusual experiment with waders came at the start of the show, covered in golden-hued dragons and hanging open at the thigh to reveal a pair of bright blue HotPants. On top, more skin, with tasseled shoulder armor leaving an exposed bellybutton. The complexity of her pieces can be overwhelming, even if they’re sent down the runway at a snail’s pace affording time for a good look. Models were perched on towering platform shoes architectural pieces, too, like the garments. Her dragons were everywhere, hailing from the Han dynasty, which had them slim and masterful at transforming themselves as was the clothing. In an example of her East-meets-West aesthetic, Guo embellished a colorful tweed with large, randomly placed rhinestones, and used it to build one of the wider pieces, overlaying a body-fitting bustier. Among standouts was a shimmery, full body dress in a stiff mother-of-pearl material. High collared, hard shouldered and long-sleeved, the train trailing behind took the most unusual form, as shown when the model took an extra spin around the colossal red columns lining the runway. 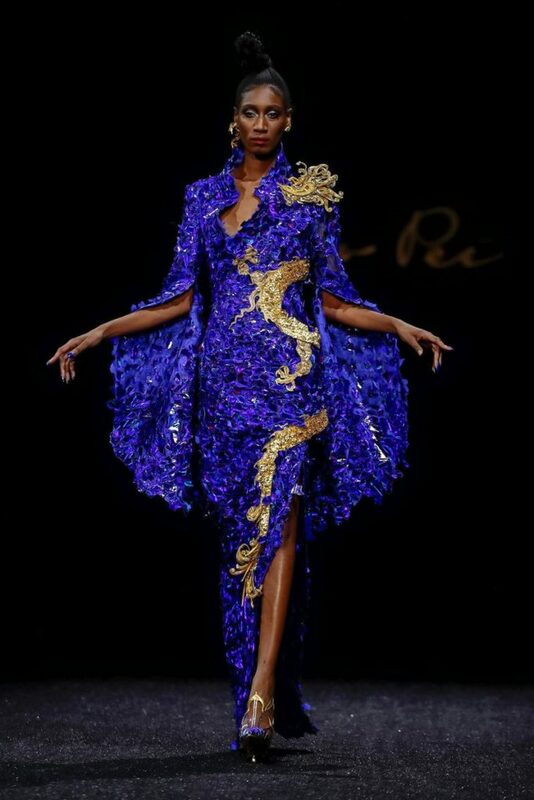 This entry was posted in BREAKING MODE, BREAKING NEWS, PARIS FASHION WEEK 2019, pfw and tagged GUO PEI by admin. Bookmark the permalink.